Plans for making classical, flamenco and archtop guitars by famous makers, including Ignacio Fleta, Antonio de Torres, Herman Hauser, Jose Romanillos, Daniel Friederich, Robert Bouchet, Santos Hernandez, Hernandez and Aguado, Narciso Yepes Ten string, Lattice, Double sound hole, Archtop, Maccaferri, Ramirez, Barbero. Also Cello Plans. Jose Romanillos has a well-deserved reputation as the finest guitar maker working in the United Kingdom in recent years. From the 1970s, when he collaborated closely with the guitarist Julian Bream, Romanillos' guitars began to be appreciated all over the world. Not only did he start making guitars with superb tonal qualities, but his supreme craftsmanship was unrivalled. Of particular note is his remarkably beautiful rosette design, now copied by many new makers (see the Picture Gallery on this website). He based his work closely on earlier guitars by Torres and Hauser, but went on to introduce his own innovations in design, finally achieving what he describes as "the true Spanish sound". 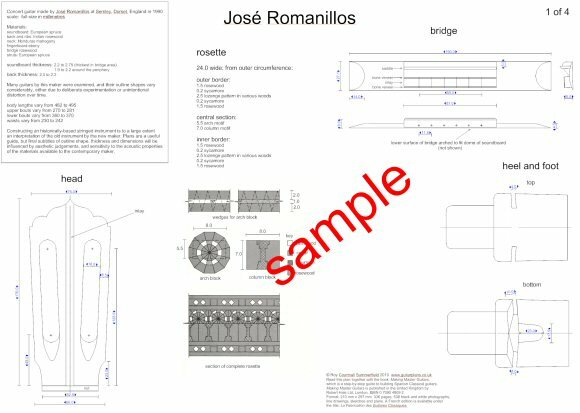 Jose Romanillos has developed several innovative strutting designs, but always closely based on the principles of Torres. 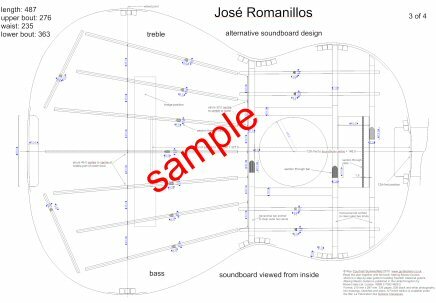 For the guitar maker who has constructed a few guitars refering to the Torres plan, it is suggested that the Romanillos plan would be an ideal one to move on to, as it provides a greater challenge due to its complexity of design. The plan in fact gives two different strutting designs that Romanillos has used over the years, enabling the guitar maker to study closely the work of the greatest British-based guitar maker of the 20th century. PLEASE NOTE - WHEN YOU PURCHASE, I EMAIL THE PDF PLANS TO YOU IN REAL TIME. IF IT IS THE MIDDLE OF THE NIGHT UK TIME, YOU MAY HAVE TO WAIT A FEW HOURS TILL I SEE YOUR MESSAGE.